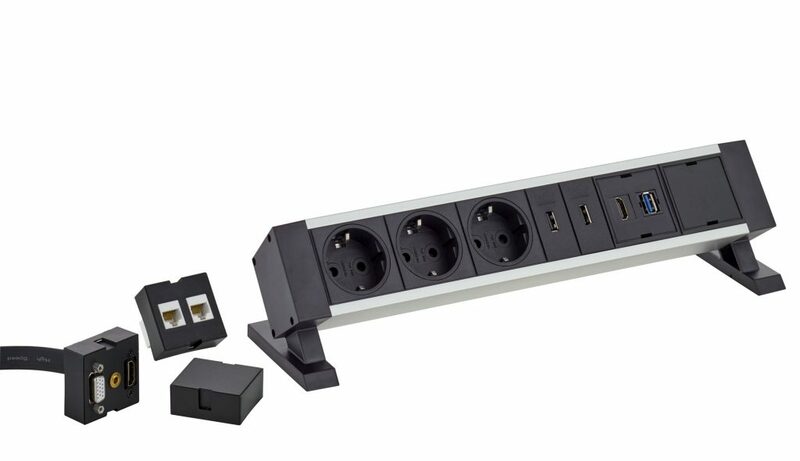 Get bespoke products all-in-one sockets at EvolineStore. EVOline is a supplier of modular systems and Bespoke Products. It develops product solutions for power and data connections. All its products are made in Germany and are designed to suit all your electronic needs, whether in your workplace or at home. EVOline holds the German Design Award for producing excellent products in 2017. The design of a properly functioning office, the product needs to take into account the flexibility, working methods, and the need for communication by having adaptive technical solutions. Luckily the new bespoke products have flexible mounting systems with round sockets that are not only suitable for your desks but can also be fitted on furniture. The new electrification systems are designed in a manner that integrates easily with any design. Whether in your workplace, kitchen or the bedroom. EVOline products ensure that you have fast and secure data or power access whenever you need it. The products are also designed to be highly adaptive thanks to the wide range of EVOline exchangeable modules inserts. When it comes to safety, EVOline Bespoke products provides a rotatable cover. This type of sockets can safely be installed in the kitchen. In such a setting, it will reduce the chances of electrocution due to spilled water on open sockets. EVOline Bespoke products are designed not only to suit your needs but also to save your time on installation. A good example is the EVOline One Round design that allows quick installation and is easily integrated on any surface, including office furniture. The product’s installation only requires one to cut out a hole that is 54 mm in diameter. Its design ensures a secure hold by a plate thickness of 9mm. The socket can either be installed horizontally or vertically depending on the owner’s preference. These sockets have special frames that make it easy to mount exchangeable modules. Different modules hold different sizes, therefore not all types can be combined. Some of the frames are 50x50mm, others are 50mm full size, while some are a bit smaller and take up to 25mm. Finally, the complete exchangeable frame needs to be filled. The size can be discussed when ordering so that the company releases the exact type of the sockets ordered. For this purpose, one would need to contact the company directly so that the factory now releases double modules as requested by the customer. The products are designed in a way that one can individually configure them to suit different needs. 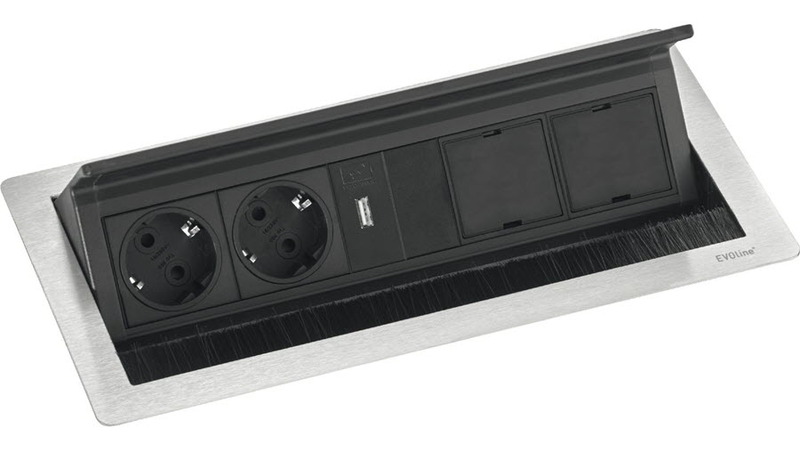 They also offer a wide range of sockets to choose from for specific uses. Most systems can easily be attachable to your work desk, and this will help you save space. If your biggest concern is saving space, you can consider buying the Fliptop Push or FrameDock. This product can be configured to suit several needs. It is designed to sit in right on top of the desk without occupying any space, unless when pushed to pop up. 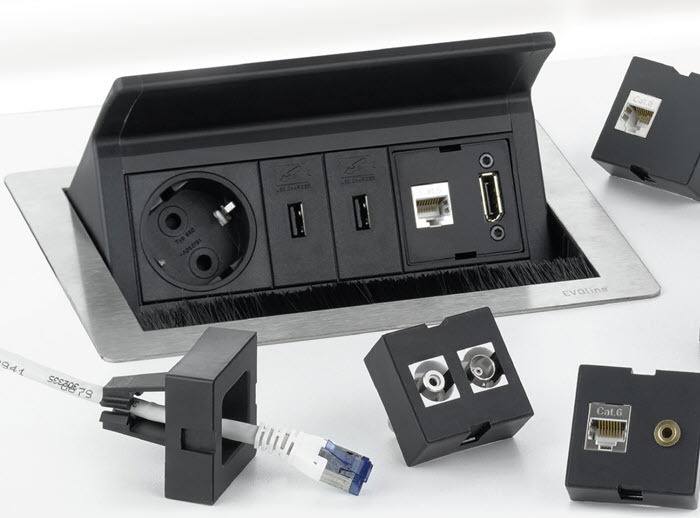 EVOline exchangeable modules make it possible to have an all-in-one socket on your desk rather than having different data and power extensions taking up space on your desk. There is nothing as good as being able to customize the selected product in whatever way you think is best for you. EVOline exchange allows you to pick a particular design but with different combinations of your choice. When shopping for Bespoke EVOline systems, you will be able to select the available designs and yet order for different socket modules. This means that you can have your power, data, and communications cable sockets all in one place. 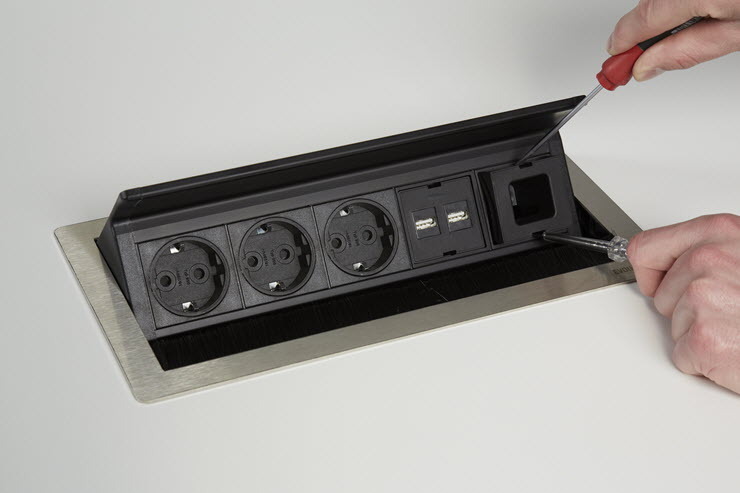 The Bespoke models provide quite a variety of sockets, including the powerful USB charging systems, port pop up sockets, power socket rails, and the fliptop push that also comes with exchangeable modules. Evoline exchange lets everything occupy the minimum amount of space.